Opening hours of the pools in the First New Spa and wellnes center Prva Nova Banja is from 8:30 am to 18 pm. 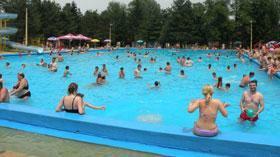 For additional information regarding Prva Nova Banja spa center and pools contact phone is 064/826-89-14 Vojkan. 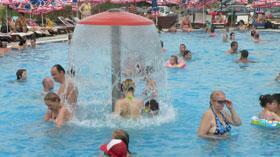 Opening hours of the pool is from 8 am to 18 pm hours. Children from 5 to 10 years - 200 dinars. For children under 5 years enterance is free. In the afternoon, from 16 hours the price is 200 dinars. Deck chair - 100 dinars.